What Are Skin & Dermal Fillers? Skin fillers, or dermal fillers, are products that doctors inject into your skin to facial wrinkles and loss of volume (fullness in your face) less noticeable. Wrinkles and facial thinning can result from age, sun damage, weight loss, surgery, or trauma. depressions (caves or hollow areas) on your skin. Fillers can augment (or smooth out) skin on your face, lips, and hand so your skin is more firm and younger looking. Doctors recommend filler products based on what areas and problems you would like to fix. Fillers usually only have mild side effects. Common side effects may include swelling, bruising, and redness at the site of the injection that can last up to seven days. *Please note that results may vary. These are the most commonly used fillers in the US. Hyaluronic fillers are similar to a naturally occurring hyaluronic acid that’s found in the connective tissues of your skin. These compounds bind water. Because of this, they are good at restoring volume in the skin and softening lines and wrinkles. These products are safe and effective to use and can last up to two years (Voluma). Radiesse is a composite type filler that is made up of small spheres and a smooth gel. Cosmetic professionals use Radiesse to augment (or plump up) the cheeks, nasolabial folds, and most recently for the skin on the hands. Radiesse is a safe and effective filler that can last up to two years. For some patients, radiesse injections can stimulate the body's own production of collagen. This can lengthen downtime needed between follow-up injections. 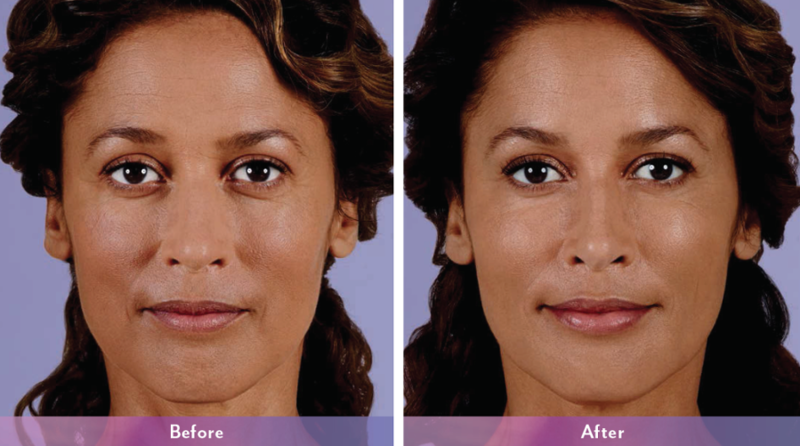 Sculptra is a filler that works best to fight overall facial volume loss—or loss of fullness in your face. It stimulates skin cells to produce more collagen over time, resulting in a more full, natural, youthful facial appearance. Sculptra can also help correct shallow to deep facial wrinkles and folds that appear with aging. It will take several months to see full results of Sculptra. Patients typically require multiple injection sessions. The results of Sculptra are long lasting and patients may see benefits for more than 24 months. Silikon is a medical-grade silicone solution and is a permanent filler. This treatment is inexpensive and best to treat many scars at once so patients don’t need repeated treatments over time. Most patients need a series of injections (usually four to five). Injections are spaced six to eight weeks apart from each other. Silikon triggers your skin to produce collagen, which slowly fills in volume loss or scars. We use a micro-droplet technique, meaning we use very small volumes of silicon at each injection site. This helps prevent the product from moving to different areas in your skin. It also reduces nodule formation. Most common side effects include bruising and mild swelling at the treatment sites. Fat injections can help correct wrinkles, depressions (caves) in the skin, and/or scarring. During fat injection treatment, doctors inject a patient’s own fat (usually from the belly, legs, or buttocks) into thinner areas on the patient’s body. This type of procedure is called microlipoinjection. During microlipoinjection, doctors transfer or recycle fat from one body area to another. This allows cosmetic doctors to re-contour (reshape) your skin. Doctors use a tiny needle to extract (or remove) fat in other areas of your body and then re-inject that fat into the selected site. Many patients prefer this treatment choice because it uses your own fat, which lowers your chances of having an allergic reaction. To determine if an injectable filler or fat injectable filler is the right decision for you, please request a consultation with one of our cosmetic specialists. Every woman deserves to feel feminine, and for many women the shape and size of their breasts can make them feel less in touch with their femininity. Our board-certified surgeons provide the safest, highest quality body procedures—including breast augmentations, tummy tucks, and more. To request a consultation for aesthetic services, please fill out this form.